What is a catheter-associated urinary tract infection? The “urinary tract” refers to the organs that produce, store, and discharge urine. These organs include the kidneys, ureters and urethra, and bladder. A catheter is a thin tube placed in the bladder to drain urine. Infections can be caused when germs travel along the catheter. Catheter-associated urinary tract infections are associated with longer stays in the hospital, higher costs, and sickness. These infections are treatable, but often, they are also preventable. 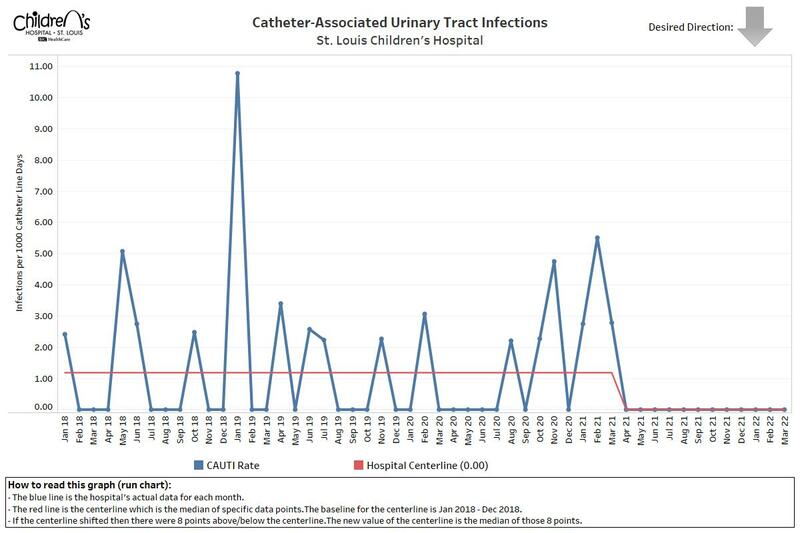 The number of catheter-associated urinary tract infections per 1,000 catheter line days. Each day that a patient has a catheter counts as one catheter line day. Medical teams review each infection to see if anything could have been done differently, or if we can do anything to improve next time. What can families do to help prevent catheter-associated urinary tract infections?